Actress Maya Lynne Robinson will be joining the beloved cast of “The Conners” as a series regular, alongside John Goodman (“Dan”), Laurie Metcalf (“Jackie”), Sara Gilbert (“Darlene”), Lecy Goranson (“Becky”), Michael Fishman (“D.J.”), Emma Kenney (“Harris”), Ames McNamara (“Mark”) and Jayden Rey (“Mary”). “The Conners” premieres TUESDAY, OCT. 16 (8:00-8:31 p.m. EDT), on The ABC Television Network, streaming and on demand. 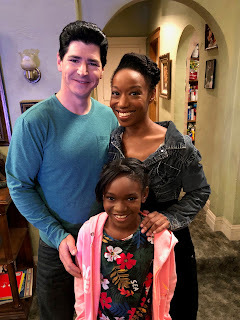 Robinson will play Geena Williams-Conner, DJ’s (Michael Fishman) wife and Mary’s (Jayden Rey) mother, who returns home from active duty overseas in Afghanistan. Her character first appeared in the iconic episode from the original “Roseanne” series, “White Men Can’t Kiss,” (OAD: 11/16/94). “We’re thrilled to welcome the incredibly talented Maya Lynne Robinson to the cast this season. Her character 2nd Lieutenant Geena Conner, whom a younger DJ was reluctant to kiss in his school play, comes full circle as his wife and Mary’s mother, bringing back a little piece of Conner history. Yet, while Geena is no stranger to the family, viewers old and new will enjoy seeing how her ‘military-style’ discipline meshes with the Conners’ more laid-back attitude,” said showrunner and executive producer Bruce Helford. Along with acting on screen, Robinson has also been active in the theater scene, most recently playing Stella in “A Streetcar Named Desire” at the Theatre at Boston Court and Eunice in the world premiere of “Runaway Home” at The Fountain Theatre as a co-lead. She has worked all over the country including The Kennedy Center (D.C.), Florida Studio Theatre (Sarasota, Florida), New Federal Theatre (NYC) and The Fountain Theatre (LA). Robinson is also the creator of the web series, “HTMAST,” and the co-creator/co-lead of the web series “GURL,” as well as the solo shows “Character Breakdown” and “Straight A Student.” She is a Helen Hayes and LA Drama Critics Circle award winner. Robinson is represented by BRS-Gage and Principal Entertainment LA.